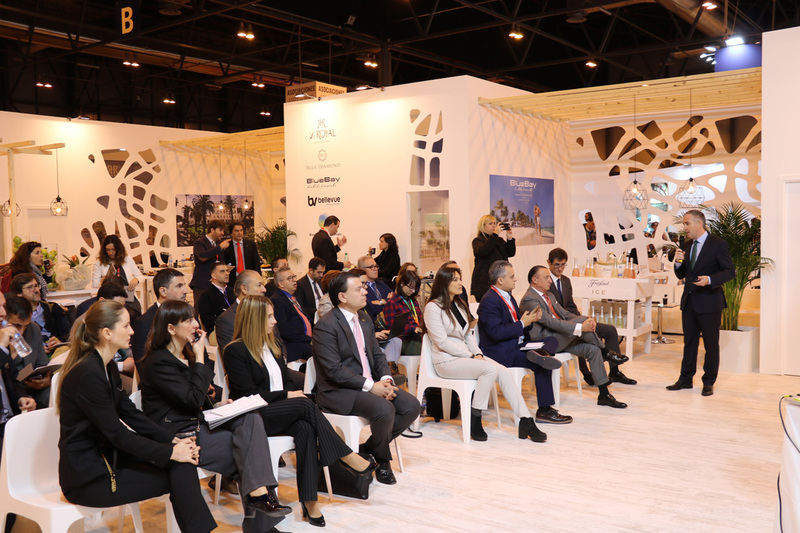 BlueBay Hotels, the eleventh Spanish hotel company regarding international presence and the twelfth largest group in terms of hotel rooms, presented its expansion plan until 2020 at FITUR. 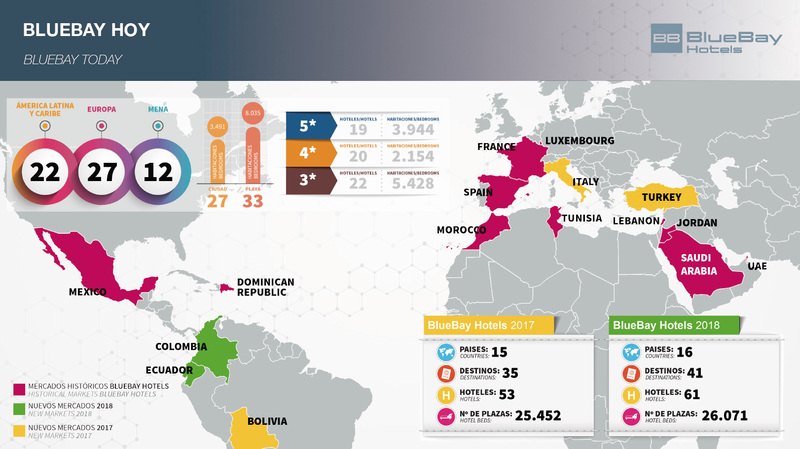 When meeting with the press, the CEO of BlueBay Hotels, Ramón Hernández, described the group’s achievements in 2018, highlighting the increase in the number of hotels, which has increased by 15%, moving from 53 hotels in 2017 to 61 in 2018, and also the increase in the number of destinations, going from 35 in 2017 to 41 in 2018 (17.1% more). He also described the group’s strategic lines of growth until 2020. These will focus on newly emerging markets, capital expenditure of 60 million euros on facilities until 2020, opening new business lines and a new website. Currently, the group has 61 hotels with 26,071 beds in 41 destinations spread over 16 countries. The company plans to invest 60 million euros in improving facilities between now and 2020. Jamal Satli Iglesias, the Chairman of BlueBay Hotels, explained “we want to equip our facilities with benefits and services that live up to the expectations of our guests, to offer them innovative and modern spaces to accompany them during their experience at the destination, provide them with an even more attractive tourist offer and gain customer loyalty”. The major renovation will be at the BlueBay Grand Esmeralda 5* Hotel (Riviera Maya, Mexico) to improve the rooms and common areas. Similarly, the Bellevue Club Mallorca 3* Hotel in Majorca will also be improved with a new renovation phase to transform facilities such as the swimming pools, restaurant areas, rooms and the creation of an “Adults Only” area. The group highlighted the most significant investments in 2018, which included the second phase of renovations at the Bellevue Club Mallorca 3* complex, different improvements to Bellevue Vistanova 3* (Majorca, Spain) and several areas of the BlueBay Grand Punta Cana 5* Hotel in Punta Cana in the Dominican Republic. In line with its expansion plan, the company continues to grow with opening new markets and consolidating its position in destinations where it is already present. One of BlueBay Hotels main destinations is the Middle East, and this is where the group will open its first new hotel in 2019, the Blue Diamond AlSalam 5-star Grand Luxury Resort in Fujairah (United Arab Emirates). The Blue Diamond AlSalam 5-star Grand Luxury Resort is located on the beachfront and offers the ultimate in luxury with a harmonious fusion with nature. The hotel features 377 grand luxury rooms and suites. Guests can also enjoy the most exquisite cuisine at the BlueBay Gourmet and Beach Club restaurants. Other facilities complete the offer, including a spa with Asian healing rituals, gym, swimming pool area and rooms for events and conferences. Children can also enjoy a specially adapted area to cater to their leisure and entertainment needs. This new opening makes BlueBay Hotels the Spanish hotel company with the largest presence in the region, where it has been operating since 2012. BlueBay Hotels portfolio in the area now consists of 9 hotels: Saudi Arabia (Bellevue Royal Al Amjad Al Salam 4*, BlueBay Makkah Grand Coral 5*, Bellevue Al Basmah Coral Resort 3*); United Emirates (Blue Diamond AlSalam Resort 5*GL and Armada BlueBay 4*); Turkey (Blue Diamond Attatürk Palace 5*GL and BlueBay Çelik Palace 5*); Jordan (Le Royal Amman 5*) and Lebanon (Le Royal Beirut 5*). Latin America is the area where the company grew most in 2018, with six new hotels: 4 in Ecuador, 1 in Colombia and another in the Dominican Republic. Colombia and Ecuador were the new destinations where the company began operating in 2018. In Ecuador, BlueBay Hotels added the Hotel Akros by BlueBay 4* (Quito), BlueBay Arahuana Jungle Resort&Spa 4* (Tena), BlueBay Galápagos 4* (Galápagos) and Hotel Poseidon by BlueBay 4* (Manta). While in Colombia, the group added Hotel Portal del East by BlueBay 4* (Armenia), and the BlueBay Grand Punta Cana 5* in the Dominican Republic. In total, BlueBay Hotels now has 22 hotels in 14 destinations in Latin America. Ramón Hernández explained that as part of BlueBay Hotels’ growth plan, it will continue to increase its tourism offer with BlueBay Vacation Rentals, a new line of business offering high-quality holiday rentals in leading tourist destinations. The first apartments to make up this new line are BlueBay Vacation Rentals at Vista Mare 4* (Samaná, Dominican Republic), BlueBay Vacation Rentals Punta Cana 4* (Punta Cana, Dominican Republic) and BlueBay Vacation Rentals Palmetto 4* (Cartagena de Indias, Colombia). All of which have top quality amenities and facilities, including swimming pools and common areas. The main development in 2018 was the presentation of the Spanish hotel company’s first cruise ship, the BlueBay Red Sea Cruise. The cruise ship with capacity for 300 passengers visits historical sites in the Red Sea, including cities in the region like Mecca and Medina that were off limits to some visitors until now. 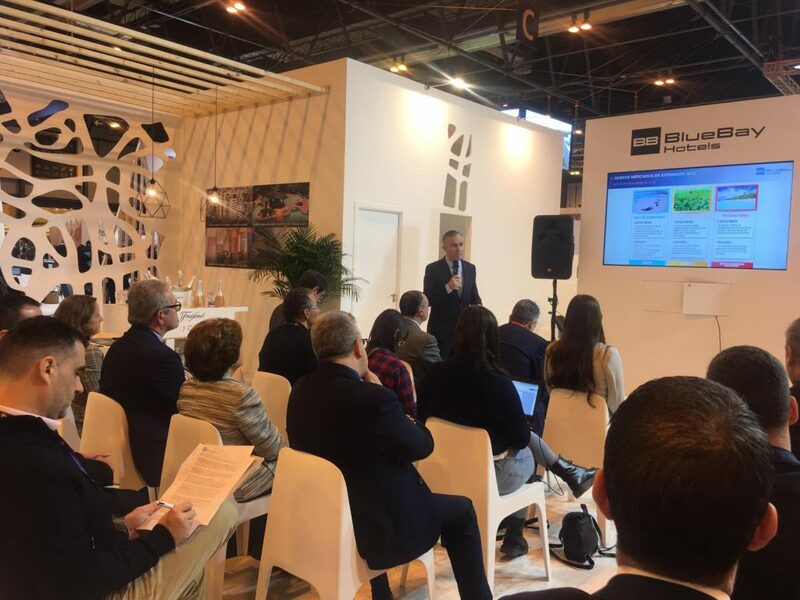 During his presentation, the company’s CEO, Ramón Hernández highlighted the need to meet the growing demand of tourists by focussing on ways to help them enjoy their experience more in the destination, and to so, BlueBay Hotels has launched a new website to enhance the experiences for travellers. In this regard, and to respond to customers expectations, the company has added a new search feature that allows customers to filter by hotels and destinations, and also by the variety of experiences available in the destination, which include diving, snorkelling, golf, horse riding, windsurfing, jet skiing, etc. The Hotel Miguel Ángel by BlueBay 5* in Madrid has also launched a new website. These new websites are part of company’s ‘InnoBBación Strategy’, which focuses on 7 aspects: strengthening the culture of innovation, fostering initiatives to promote commercial actions, innovating in the creation of a management platform to integrate internal processes, reinforcing commitment with employees and customers, attracting new talent and developing appropriate training content to cater to the current needs of the sector. As part of this innovative approach, BlueBay Living Lab was brought to life in San Agustín in Gran Canaria in January 2018. With a philosophy of open innovation, the aim is to create an innovation ecosystem to mobilise and facilitate innovation in the Canary Islands tourism sector and make the islands and especially Gran Canaria world leaders in tourism innovation. The Lab is the operational centre where the company analyses and develops innovations resulting from collaboration among tourism companies, entrepreneurs, and ICT companies in the Canary Islands. BlueBay Hotels has also developed several projects in collaboration with third parties. These include innovation in spaces by merging decoration and technologies, creating sensory rooms and the development of a multi-circumstantial and sensory platform.